Durable and flexible, GBK checkweighing bench scales provide a superb value for businesses that need a scale to perform multiple functions in warehouse and industrial settings. The GBK is well-suited for use on production floors, at bakeries, in shipping and receiving operations, at wholesale operations, and even during auctions. All GBK bench scale models feature a full numeric keypad and checkweighing lights to simplify operation. Approved GBK-M models are suitable for use in trade settings where goods are sold by weight. GBK scales include checkweighing capabilities that are particularly useful for food packing facilities. Each packed product can be placed onto the scale to ensure that it meets to pre-defined weight limit. The stainless steel weighing pan allows the scale to be easily washed down after use. 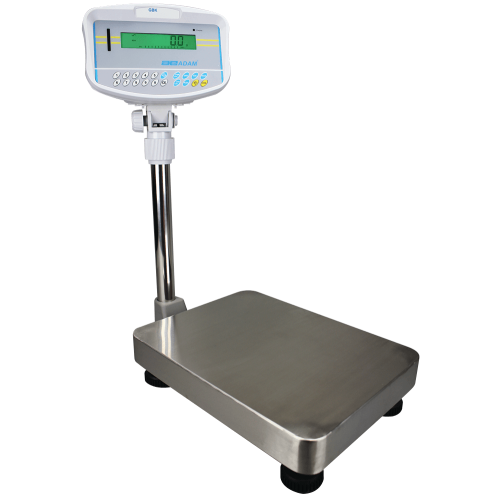 GBK-M scales are EC trade approved in order to buy and sell products by weight. Whilst the scale does not feature price computing, an accurate weight value can be obtained which can then be used for manual price calculations in units. GBK scales are built to endure tough weighing conditions an make excellent warehouse scales. The checkweighing capabilities of this scale allow it to accurately check the weight on manufactured products, screws, bolts and tools.